The goal of this educational program is to provide clinically relevant updates on the treatment of patients with hematologic malignancies likely to undergo allogeneic stem cell transplantation. The activity will focus on increasing clinician knowledge and the ability to integrate changes into practice to improve patient outcomes. 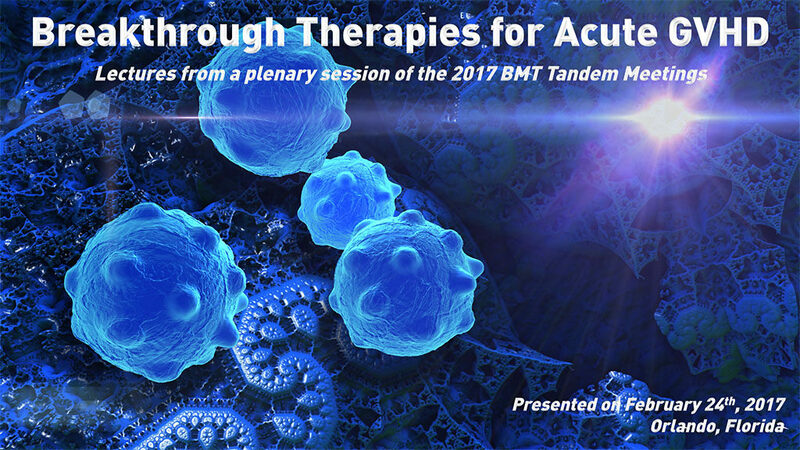 The program will highlight the changes in treatment that acute Graft-Versus-Host-Disease (GVHD) is experiencing due to recent implications of clinical trials and breakthrough designations of target agents. The intended audience for this activity is transplant specialists, oncologists, hematologists and other healthcare professionals involved in the treatment of patients with GVHD. The Medical College of Wisconsin designates this live activity for a maximum of 1.0 AMA PRA Category 1 Credit(s)™. Physicians should claim only the credit commensurate with the extent of their participation in the activity. This enduring material is approved for 1 year from the date of original release, June 27, 2017 to June 27, 2018. James Ferrara, MD, DSc discloses that he has a GVHD biomarker patent from which he receives a royalty. Motoko Koyama, MD, PhD has no relevant conflicts of interest to disclose. Ernst Holler, MD, PhD discloses that he serves on the advisory board for Pharmacyclics. He also has received honoraria from Prime Oncology and Sanofi. The Medical College of Wisconsin and Carden Jennings Publishing report the following relationship(s): No relevant financial relationships to disclose. This continuing medical education activity is provided by The Medical College of Wisconsin. Collaborative Partner: Carden Jennings Publishing. This activity is supported by educational grants from Incyte.